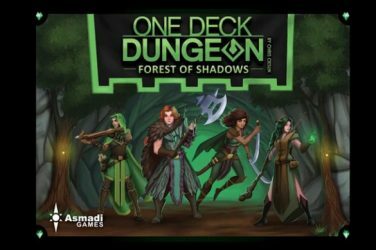 Nestled deep in the back of the hall at Gen Con was an unassuming booth with several very friendly people demoing two games. 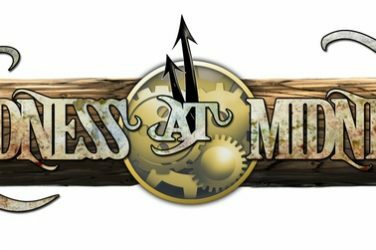 The first I had played and loved at my local game night after missing out on it at Origins Game Fair – Arkwright. 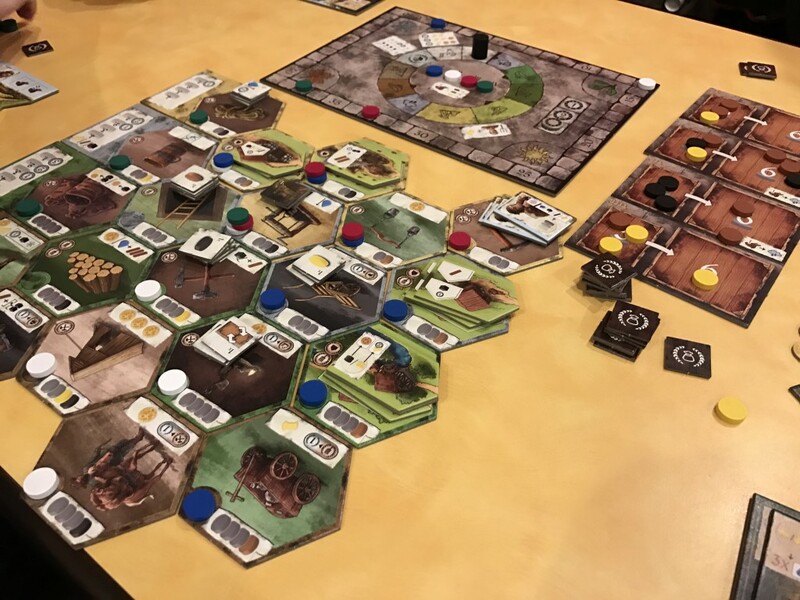 The second was the first American Release of the third game in Thomas Spitzer’s Coal Trilogy, Haspelknecht, and it was due to release just a month or so after the show. Even with the huge number of brilliant games that came out of Gen Con, including my favorite of the year, Terraforming Mars, Haspelknecht stuck with me and I eagerly awaited its arrival last month. Since then I’ve played it several times, and the game has left me with mixed feelings. On the one hand, I love the simplicity and speed of the game. I love the clever mechanics and the way everything flows together smoothly. 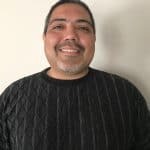 But there are issues – drawbacks that weren’t apparent in that first play and that I worry might bring this one down a notch, not just now but increasingly so in the future. Haspelknecht is a game about the great coal discoveries of the early industrial age in Europe. Players are farmers who have recently discovered coal on their land. You will spend the game mining the coal, first from the surface Pinge, and later from a mine shaft built under your land. At the same time, you must also grow crops that will allow you to feed your family, and build discoveries that make your farm and mine alike more efficient. If that sounds overly complicated, like Agricola with coal mines, don’t worry. It’s really quite straightforward. 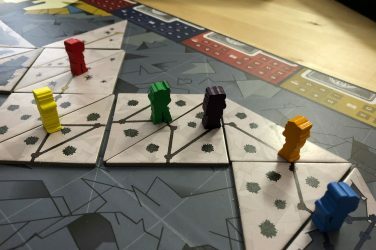 In fact, Capstone went out of their way to release the third game of the Coal Trilogy first because it is the simplest of the three. If you’ve played Arkwright or Kohle and Kolonie, this is nowhere near as complicated as either. The game takes place over three years, each with four seasons. 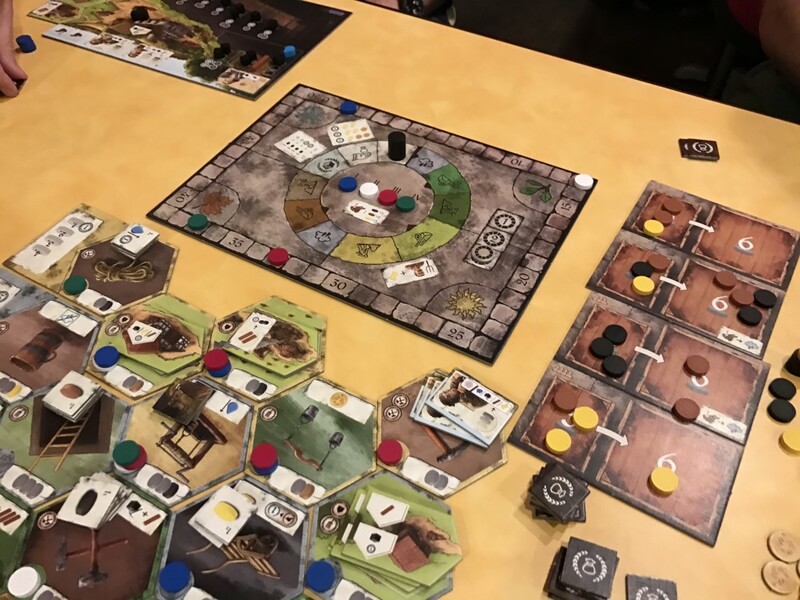 In the first three seasons, you will gather Action Discs, which, thematically speaking, don’t represent much of anything – brown gets you wood, black helps mine coal, and yellow generates food (or activates the Haspelknecht). You can also use combinations of these discs to build discoveries – some of them comically obvious (bucket and rope?) and others more thematically linked (carts and mine equipment). Players will take turns drafting these action discs so it’s possible you won’t always get what you need in a single draw, and sometimes you may be forced to take an extra water for your decision (water builds up in your Pinge and Mine shaft, making it impossible to remove coal without first removing the water). The mechanisms here are very simple though. There has to be some balance between discoveries, coal mining and resource management so that you have what you need to pay your taxes, generate enough points each round, and mitigate point loss at the end of the game. 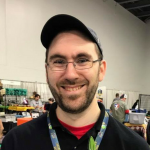 All told, it takes 10 minutes to teach this game to new players and the game can be played in less than 90 minutes, even with new players at the table – all of which was very enticing to me when the average heavy euro is twice that length and a bear to teach. So how does it actually play? The game does play quickly and it does present a low barrier to entry. 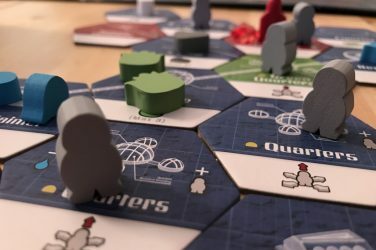 We learned and played almost the full game at Gen Con in 55 minutes with three players and since then most plays haven’t been much longer than that, even with a full four players. The game also provides a lot of decisions to make. The discoveries are plotted in a grid that is randomized each time and may be missing some key technologies if you have less than four players. 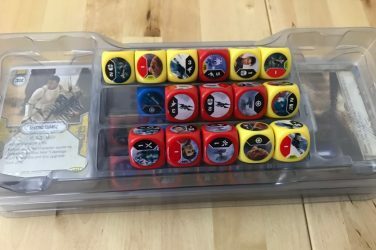 This, combined with the variability of the discs that come out will force you to make slightly more tactical decisions each round. That’s a lot of fun, and the puzzle aspect of trying to mitigate losses, balance them against potential point gains, and ensure you can get enough coal on your board is all very interesting. Production-wise, this is the best looking of the coal trilogy, and has high quality components that fit the theme of the game well. I got a feeling after the third play, in the back of my neck that there was something just not quite right here. It was still good, but was it still fun? 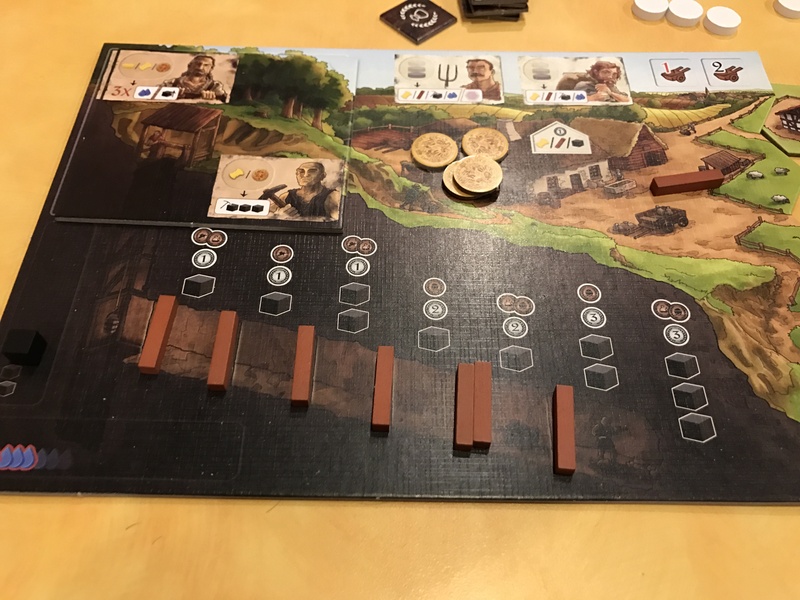 The problem with Haspelknecht – one I’m having a hard time shaking – is that it feels very much the same each time I play it at this point. There is certainly variability in the gameplay. The tech tree is different every time, but it’s not that expensive to go wherever you want on that tree. In fact, the penalties as a whole in this game aren’t substantial enough to dissuade you from ignoring key rules. Getting an extra water for going after better action discs? Not a huge deal. Taking debt tokens instead of using that yellow disc for food? No problem. In fact, in my second play, someone at the table almost completely ignored mining coal and came in a close second with 51 points. He built buildings and generated coal from wood – it was a good little engine, but he was ignoring 50% of the game without penalty. That very freedom would excite me in a lot of games, but in this particular one it feels…off. Like the game wasn’t meant to be played that way and it really doesn’t feel the same when you do it. Combined with the sameyness that can start to seep in after a half dozen plays or so, Haspelknecht is a tough game to recommend for purchase. It’s a good, borderline excellent light euro that has an interesting if slightly under realized theme and fits a very important niche in my game collection. But it’s not one I see myself playing much if at all in a year or more from now. 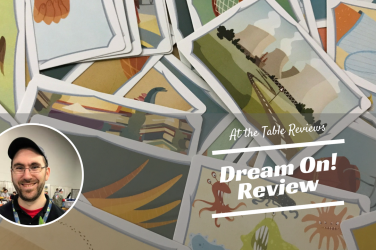 It’s going to be overlooked in favor of a lighter Stefan Feld game or The Voyages of Marco Polo – the games that currently fit this bill for me. But, the first plays are fantastic as there really is a lot to like here. The game doesn’t age as well as some, but if you get a chance to play it, give it a go. Editors Note: The original article incorrectely stated you could opt not to pay taxes in Winter and save coins. This is not correct – if possible you must always pay taxes with available resources. It may not be worth a full purchase, but Haspelknecht is a fun light-medium euro with a low barrier to entry and some unique mechanics that work well in the context of the theme. Give it a play if ever given the chance.